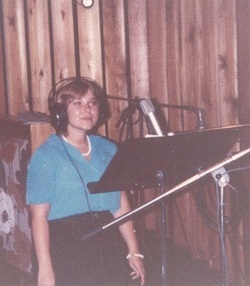 In the recording studios in the 80's. I am a former singer/songwriter who had a singing ministry for a little over 30 years. But about 14 years ago a tumour was discovered in my abdomen and when the doctors took it out they accidentally ruptured my bladder without knowing it, sewed me up and sent me back to recovery. When I didn’t recover as expected, I was sent back in for emergency surgery. Somewhere in that time frame my vocal chords were damaged due to being intubated. Although I was assured that my voice would come back it never did and to make a long story short the Lord began a “new work in me” that ended with my first novel – Come to Me. Not really. Over a period of several months while I was recovering from my surgery, I struggled desperately to get my voice back. I went through a time of depression because I couldn’t understand why the Lord would allow my voice to be taken away. But during that time a story was beginning to form in my mind about the life of Christ through the eyes of his mother. I had the distinct impression from God that I was supposed to write about it, but I was so angry at losing my voice I ignored it because I wanted my voice back. Besides, I couldn’t see the end of the story, only the beginning. But, over time the desire to write became so strong that I could not ignore it. Until one day I went to my computer, placed my hands on the keyboard and said, “Okay, Lord. I surrender. Use my hands as you used my voice.” The next thing I knew the floodgates were opened and I didn’t stop typing until the story was complete. That’s for sure. About a year, maybe less, after my surgery, a fall down a flight of stairs left me partially disabled. In time, other problems set in, including arthritis. Then I was diagnosed with a disease called lipo-lymphedema, which affects my lymphatic system. Which causes my legs to swell and requires me to keep them elevated all the time. I have to spend two hours everyday in something called a lympha-press that massages my legs to get the lymphatic fluid moving. It has pretty much zapped my ability to move about on my own. However, the good part of this is that it forces me to stay at my computer writing every day! Not including my song writing days, it would be about 14 years. Four - Come to Me, a Bible study to go with Come to Me, called Learning from the Master, Living a Surrendered Life, He Who Has an Ear, Who the Seven Churches of Revelation are Today and Unlocking the Truth of Daniel. Unlocking the Truth of Daniel is a Bible study on the book of Daniel that looks at prophecy and history together. It shows, very clearly, how certain prophecies in Daniel have been construed by prophecy teachers to be something that is end-time related. But, as the study shows, many of these "prophecies" have already been fulfilled in history and are not end-time related at all. It is the first book in a new series called Digging Deeper. Yes. It is important that Christians actively investigate God's Word for themselves. They have got to stop taking the word of "celebrity preachers" as the truth and instead find out that truth for themselves. Unlocking the Truth of Daniel, will take the reader through each verse in Daniel and present them with questions they will be forced to look up and answer for themselves. It will be accompanied by historical facts as well as the latest commentary on what prophecy teachers believe today. It is my hope that readers will ask questions and dig deeper to find the truth for themselves. I don't want them to take my word for it, but to rely on the Holy Spirit to guide them into all truth. This book, just helps lead them on their journey. Sounds exciting! I can't wait to "dig deeper"! Any other projects on the go right now? I am currently working on the second study in the Digging Deeper series. It will be on Revelation. Will you be approaching the study of Revelation the same way as you did Unlocking the Truth of Daniel? Yes. It's very important to keep Scripture in context with history. We can't assume that all of Revelation is end-time related. We have to dig deeper to see what has already been fulfilled throughout history. That said, much of what I'm discovering during my research proves we are definitely living during the end-times.